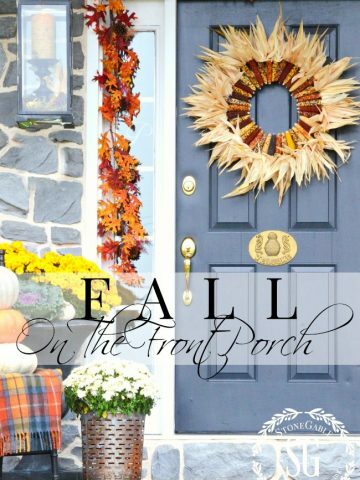 Fabulous fall front porch! We all want one and they are a big Autumnal welcome to all who pass by. 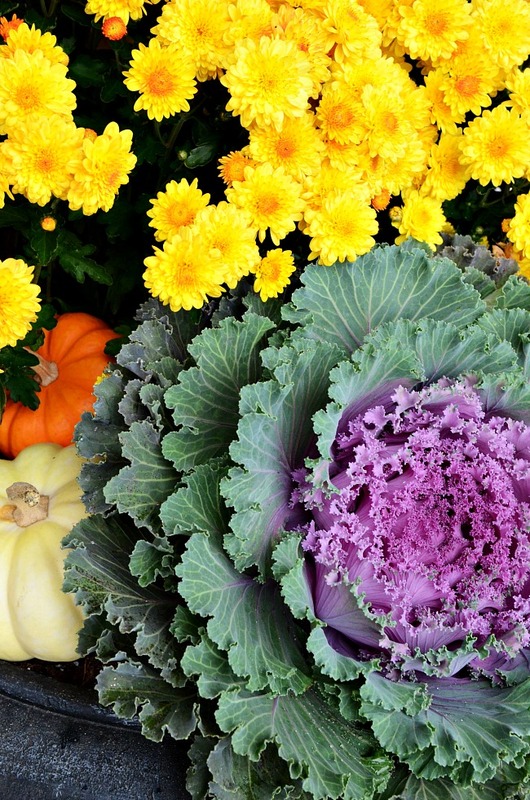 Lots of saturated fall colors, stacked pumpkins, mums and Indian corn. 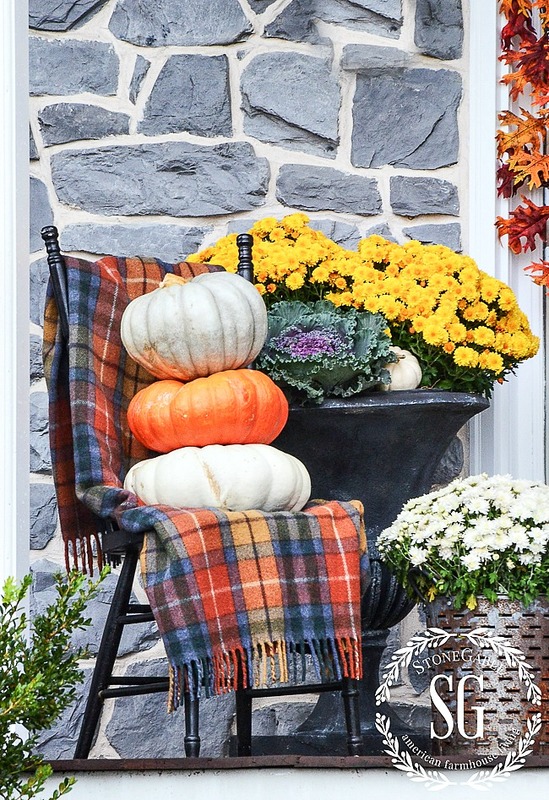 These elements are all mixed together with a touch of antique tartan to give my front door and porch a big punch of fall! 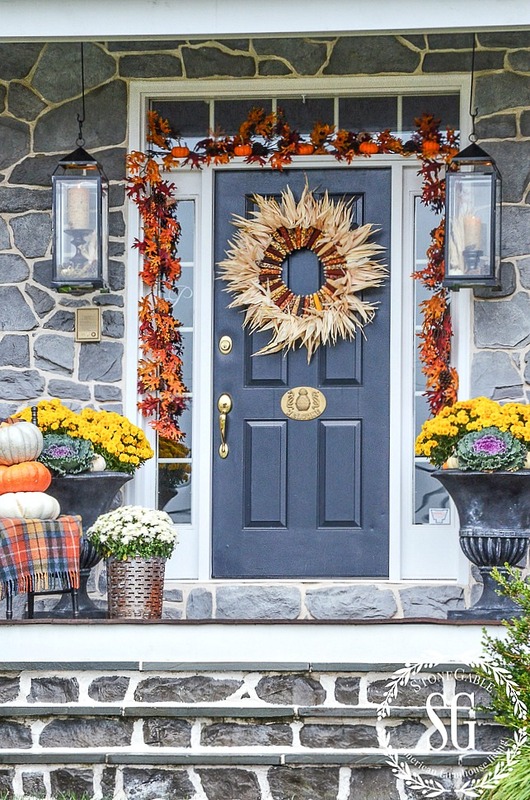 Welcome fall and all! We’ve been waiting for you! 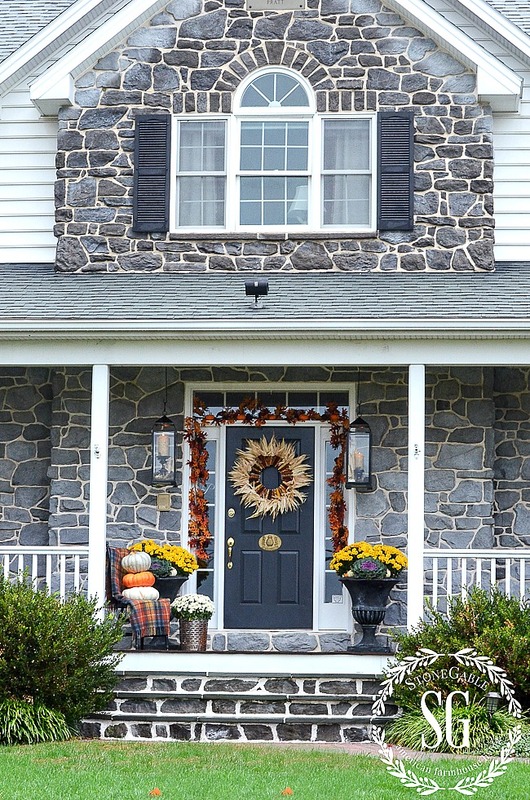 Today on Decorating Tips And Tricks we are talking about CURB APPEAL AND HOW TO GET IT. What a perfect topic for today’s’ post! And you can listen to any/all episodes HERE. Don’t forget you can listen to DTT on the podcast app of your smartphone and other devices. And if you like us, PLEASE rate and review us on iTunes. We would really appreciate it. Thanks! 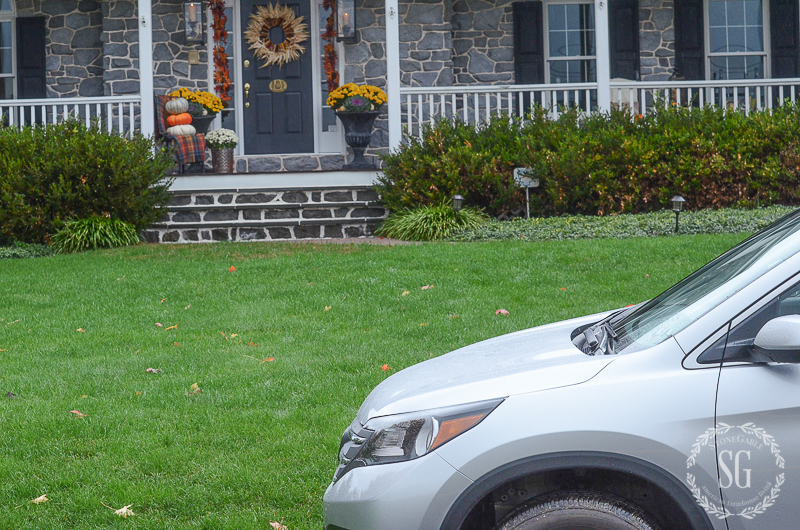 Now let’s make our homes have lots of fall curb appeal! The day I took these images it was pouring buckets and buckets. Actually, most of them I took from the car. And here’s a little insight to just what a blogger will go to get pictures. I drove my car around my front lawn, rolled down the window and shot the pictures from the driver’s seat of the car! The best time to take outdoor pictures is when it is cloudy, but this puts a whole new spin on taking pictures! The rain made everything looks so vibrant! It’s having a bad hair day… just like me! The rain puffed up the husks! And I think it makes the wreath look really pretty! 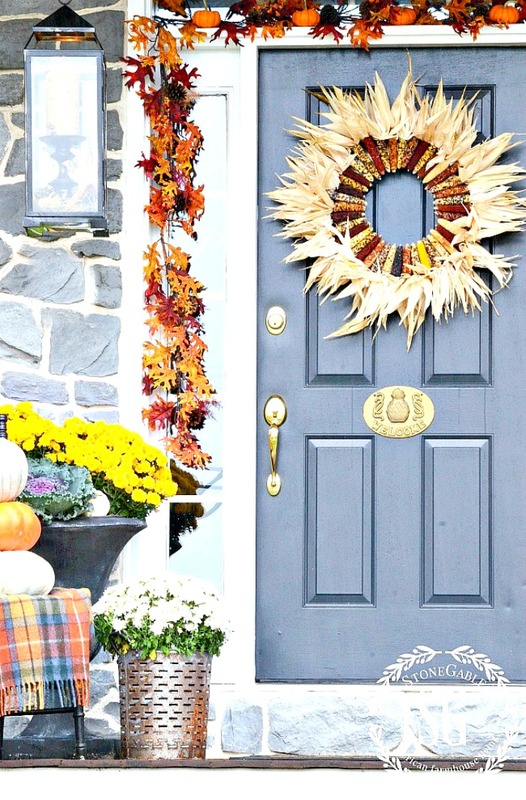 A leafy garland frames the door and little pumpkins sit on the ledge of the transom! On a trip to Savannah (oh, I love this girly city and get back when I can) I noticed initials on the transoms of many front doors. And of course, I fell in love with this personal detail. So I ordered a frosted letter cling on “P” for our last name. It has held up for years. And every time I look at it I remember my second favorite city! 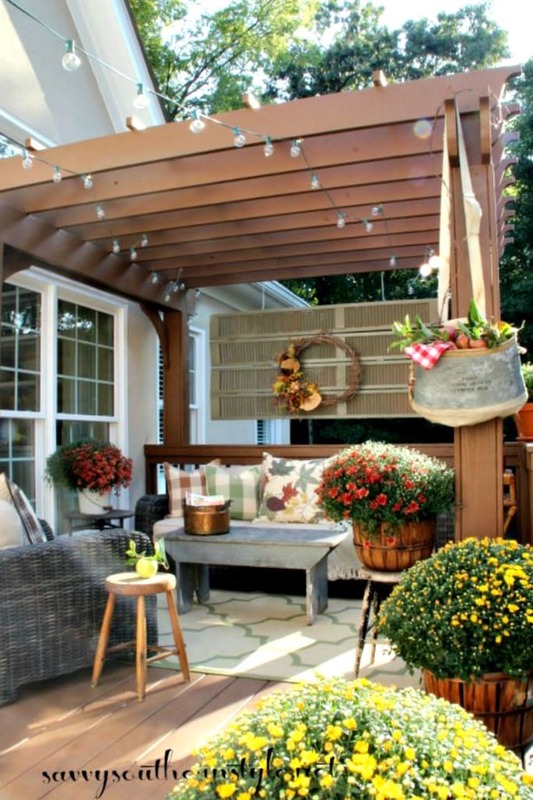 This image gives you a good look at the faux leaf and bittersweet garland. The garland came from a local shop. 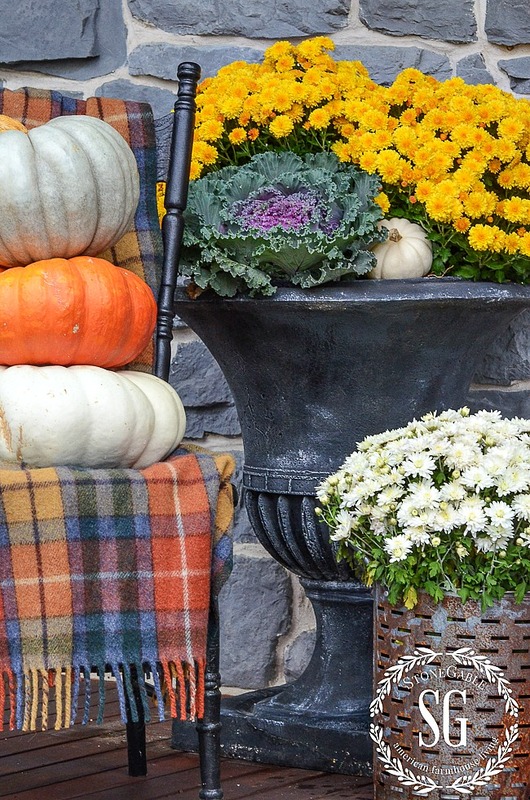 I filled the porch urns and galvanized buckets with mums, flowering cabbage, and pumpkins! This little chair was my great grandmothers. I painted it a chippy black and moved my pumpkin totem to the chair. I have battery operated candles on timers so they go on at dusk and stay on until we go to bed. I love the little glow they give off at night! 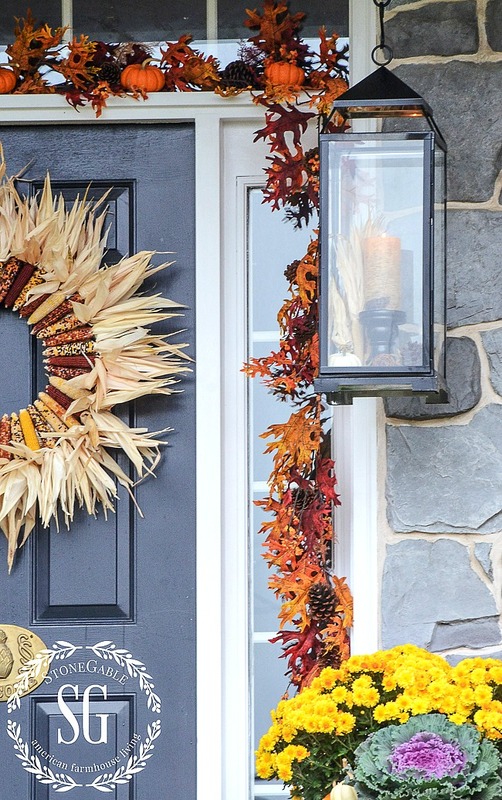 I’d love to hear how you decorate your front door for fall! Today is HOME STYLE SATURDAY. We are bringing your our archived best. A big thanks to my friend Lory from DESIGNTHUSIAM. 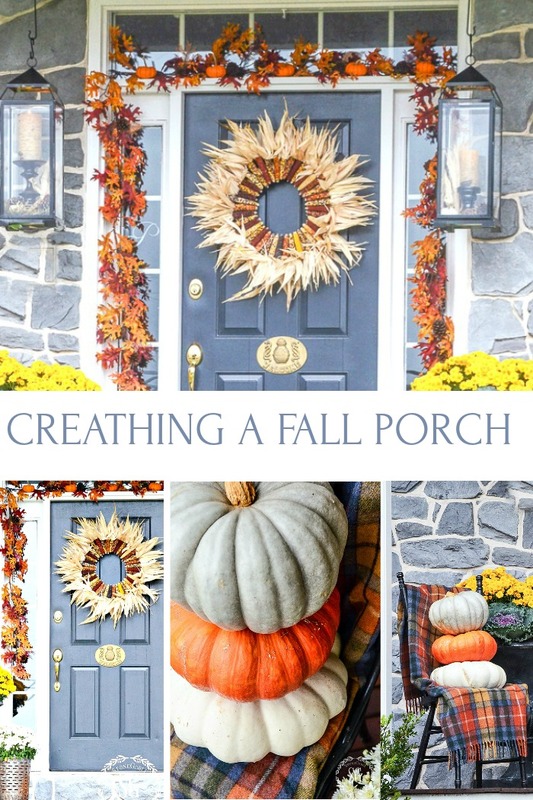 Check out her beautiful blog and all the great ideas from my HSS friends! Love your blog!!!! 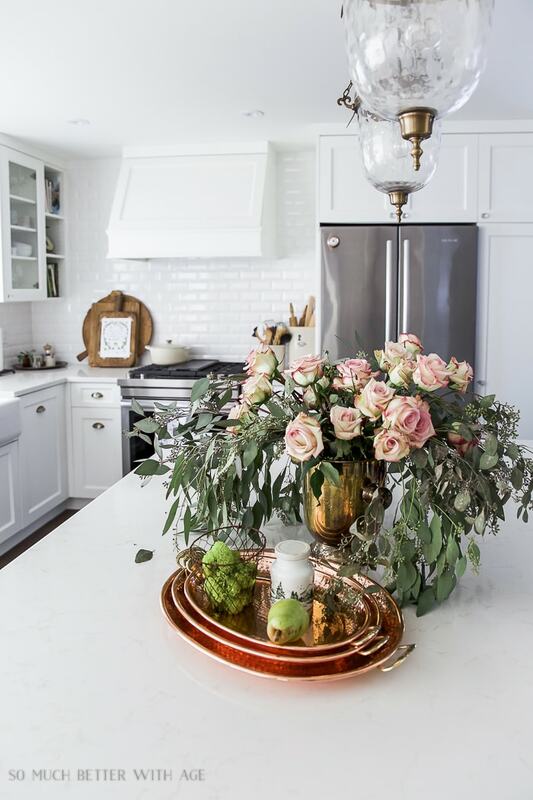 I’ve gotten so many wonderful decorating tips and ideas! 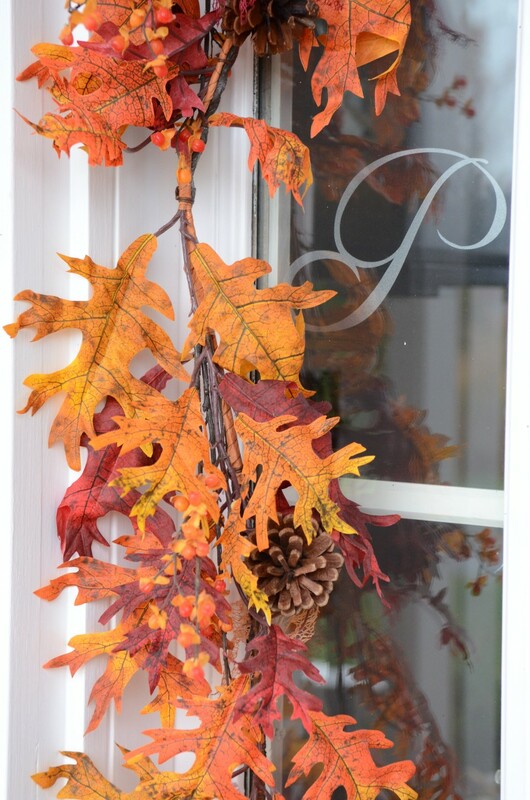 Loved the letter (P) window decal shown on your fall front porch blog. How cute!!! Looking to find one for myself, but having trouble. Do you have a link or suggestion where I should look? Thanks!! Hi Beverly, I got this so many years ago. Check on Etsy for someone who creates vinyl letters. Get a frosted vinyl and have a mirror image made so it can be stuck to the inside of the window and be read the right way from the outside. Hope this helps. 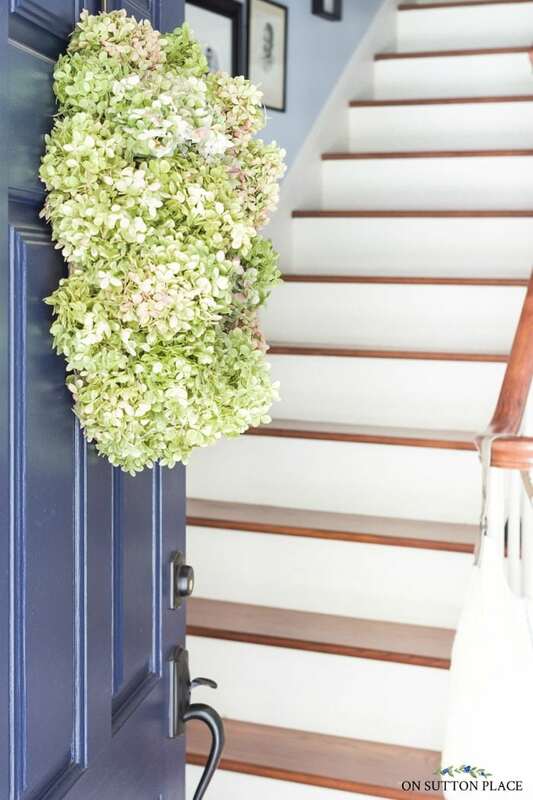 Love your door area! Please share your source for the letter P . I think it would make a nice Christmas gift for my daughters -and me. I’m forwarding your blog to a friend . She asked me at dinner last night how she could find blogs, and since you’re my favorite -the answer was easy. THANKS! It’s been over a decade that I put the frosted letter in my window so I forget where I got it. I did get a white frosted letter and had it made so it was a mirror image so I could stick it on the inside window and the letter would appear correctly from the outside. Look at Etsy shops that make vinyl letters. 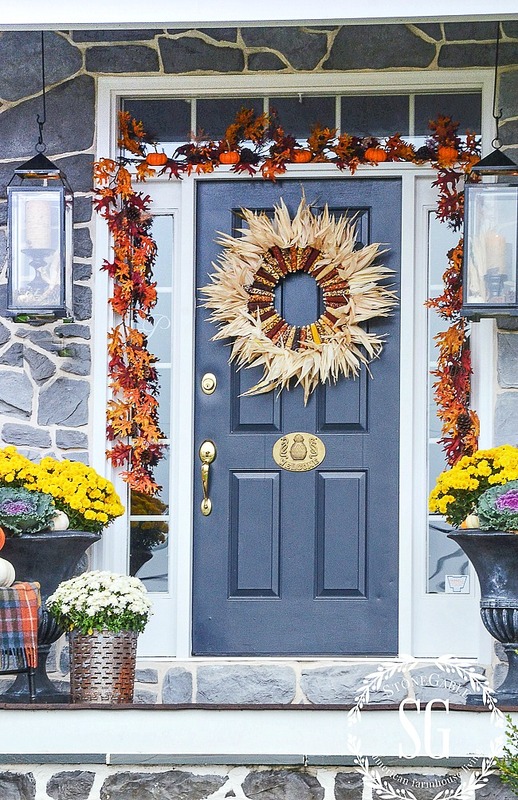 I love the color of your front door and how you decorated for Fall. I read about how you keep pumpkins fresh and will try your tricks. The weather will remain warm down here for a while, so I will need to wait a few week before putting out mums. 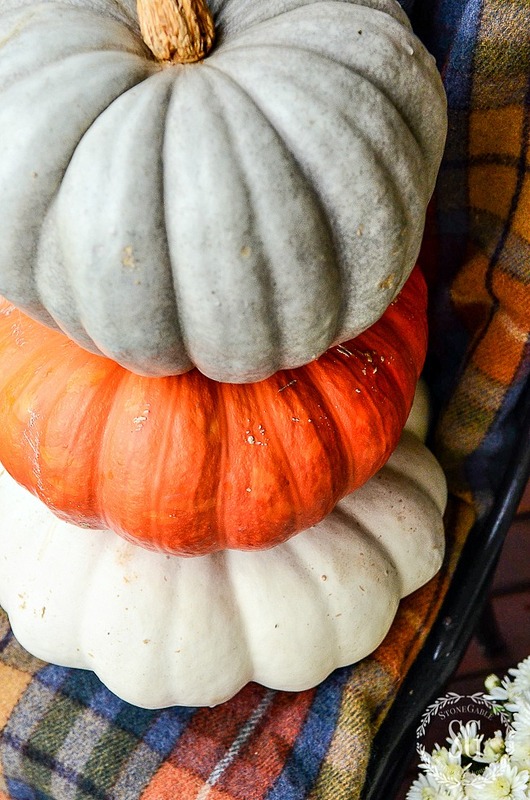 Your post has me itching to decorate something for fall, so I’ll play with my mantel! Thanks for all your wonderful ideas. 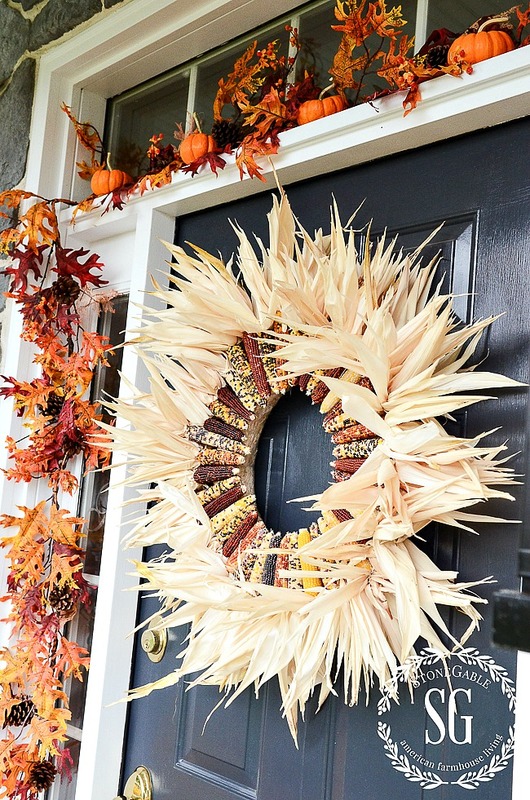 Hi Cecilia, it’s still warm here too but I just couldn’t wait to decorate for fall! Check your boxwoods. I noticed that they are turning brown in places, and our landscaper warned us that it’s a sign of boxwood blight which is going around. We’re selecting plants for our new landscaping in our courtyard and front yard, and we’ve been made aware of it. I don’t want to alarm you, but just have them checked. Your porch is lovely, by the way. Hi Janette. We had to pull out all of our boxwoods. We lost a few and relandscaped. So sad! Oh boy! My favorite time of the year is coming! 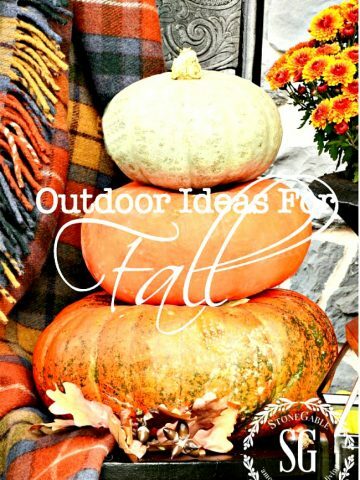 I always get giddy when I see your ideas for Fall popping up. It literally makes my day! 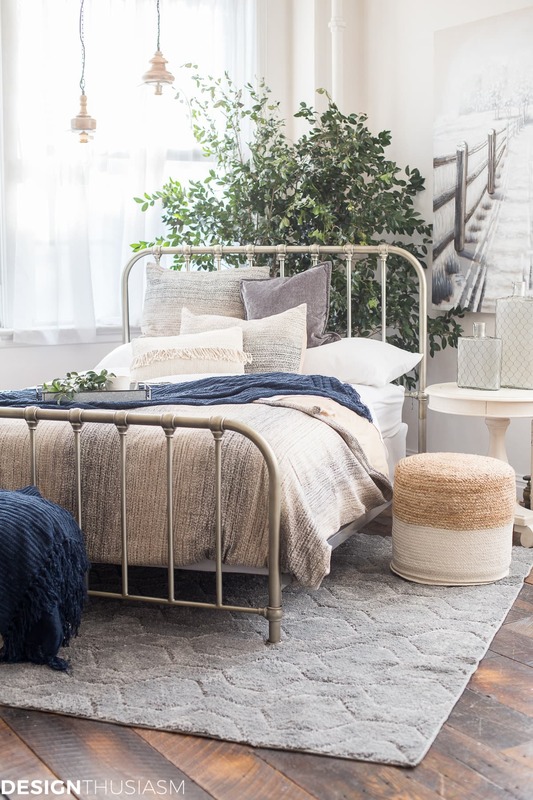 It’s a little too early and still hot where I live to start decorating, but it’s never too early to start planning and getting ideas. I love how you guys hung the lantern on the porch. I have a lantern I just might ask my hubby to hang for me now! Every single day, I am inspired by something beautiful here. Have a wonderful day, Yvonne! We use them all year long. They add such a pretty glow to our porch! Hi. I am a new subscriber; for decorators that don’t have a lot of spare time, I suggest a clear fishing line. If you can’t put up a few permanent finish nails for multi-seasonal use, you can use some hardy temporary push pins. 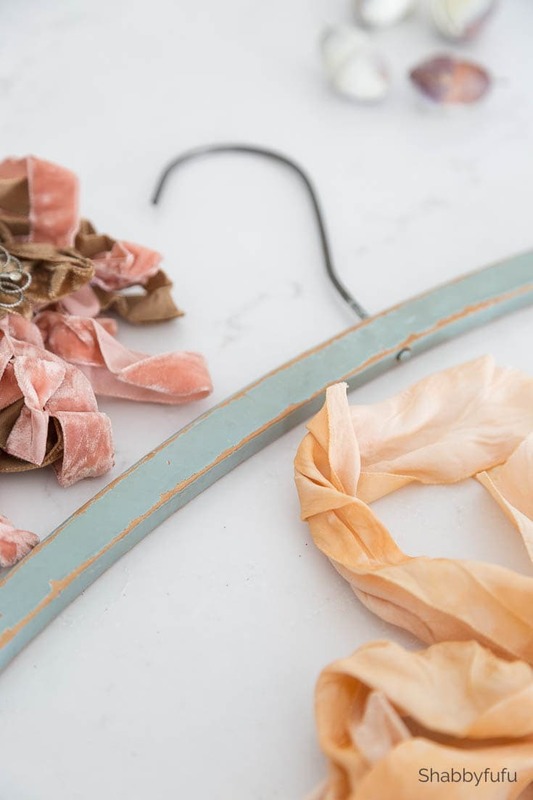 You can usually find a nearby leafy tree for Fall decorating, greens for the Winter to trim, I prune some Holly from my Holly bush just before the Christmas Holidays., force some bulbs prior to Easter, that I pull out their bowls roots and all, that I tie up with a pretty ribbon. this works as a special welcome for our holiday guests, that I hang by the door. I would replace them with white roses and baby’s breath. it up with butchers twine, making sure to tie the ends in tightly, add more salt, pepper. serve it. The burnt pork belly will look a plucked turkey. There are some recipes online and on youtube but, they add garlic which not good for Irish tummies.